187 (Early Series) Cigarette holder and ash tray. No numbered example is recorded. Do these shapes appear in other series? Holder - no (none recorded). Ashtray - don't know. Another 'Ashtray and Holder' set is recorded at Early Series 219 and Later Series 55. Dimensions; Ashtray, unknown. Holder, height 5 - 6 cm. Bases incised Remued. Believed to be the shape of the Early Series 187 cigarette holder. The 187 ashtray is unknown. 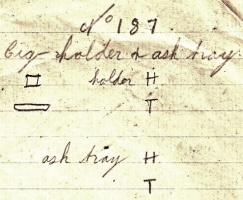 Several un-numbered ashtray shapes are recorded however; click here.